Asos is quickly becoming one of my most visited website – I can’t help myself. Theres so much I would love from there this A/W so I thought I’d share what I’m loving! I’ve been looking for a coat like this for such a long time and this one is an absolute steal. Originally at £50 but now down to £37.50, whats not to love? I also love the colour of this a really lovely dark grey. Perfect for a stylish autumnal outfit. If I’ve never mentioned before, I kind of have an addiction to striped clothing. I love this top, it looks perfect for casual days at home or going for a walk layered with a chunky winter coat. I looove cream/white chunky knit jumpers, I think they can look so sophisticated and classy. Especially this one due to the roll neck, super cosy for a/w. Pinafore dresses seem to be one of the in things right now and personally I’m loving it. I think this one would look lovely paired with a thin jumper, tights and boots. Something a little more pricey but oh my gosh can we appreciate this jacket, so super fluffy and warm. This would love lovely with a little denim a-line skirt. Didn’t I say I loved stripes? Oh and also chunky knit jumpers haha. This one is so gorgeous, I could see myself really wrapping up warm in this, this winter! I’d previously tried this on but the size didn’t fit me. But luckily I found it in petite so maybe I’ll try again. I love skirts and suede seems to be the new in thing. Lovely colour for autumn too. I’m always a sucker for an oversized shirt, and I thought this was a bit of a change from the typical checked flannel shirt. I really like the colour of this too. 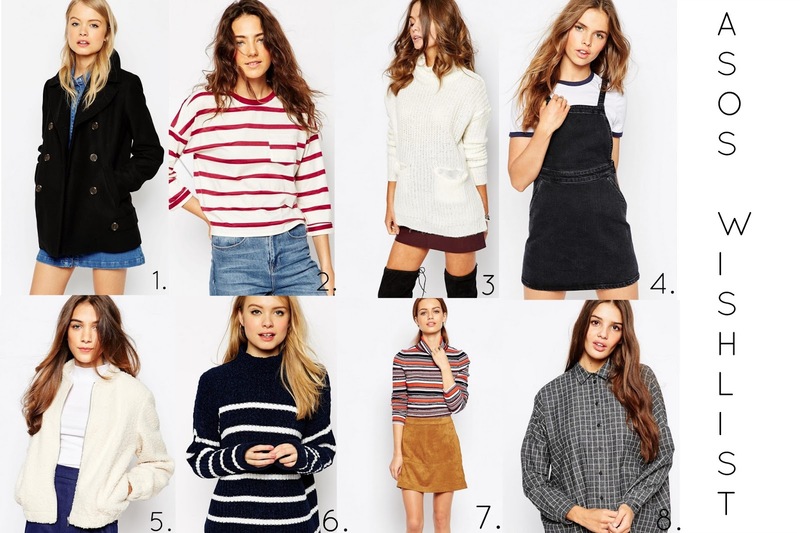 Have you been loving anything from Asos recently?